Child-friendly? Tim Burton's characteristic spooky weirdness comes out in full force with this latest stop-motion effort, but at the core, it's a heartwarming story of a boy and his dog that kids of all ages are sure to enjoy. Depending on where you fall on the Tim Burton appreciation scale – which ranges from the accessibility of the original Batman to the unbridled eccentricity of Sweeney Todd: The Demon Barber of Fleet Street – you might have different feelings about his latest effort, Frankenweenie. Sure, he's done the stop-motion animation thing to death with The Nightmare Before Christmas and Corpse Bride, which could have you rolling your eyes at taking your kids to another child-friendly spookfest. But personally, I'm willing to give old Timmy the benefit of the doubt more often than not. He's cooked up enough classic films like Beetlejuice, Sleepy Hollow and Ed Wood that I'm willing to take a risk on a possible bomb (ahem… Dark Shadows). Beside, his last few flops have all starred Johnny Depp for the 10,000th time – and Cap'n Jack Sparrow is nowhere to be seen this time around. I'm also a sucker for stop-motion either way, especially with the addition of a retro black-and-white aesthetic. 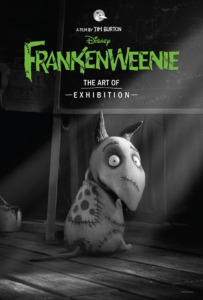 Burton goes back to his roots and dusts off his 1984 short film Frankenweenie to be remade this time around. Taking plenty of cues from Mary Shelley's Frankenstein, the movie follows the young scientist Victor Frankenstein (and yes, this time it IS pronounced Frankenstein) and his beloved pup Sparky. During a baseball game one day, Victor hits a home run, but Sparky is hit by a car while chasing it into the street. But that's nothing a little science can't fix, right? Victor digs up Sparky's remains and harnesses the power of lighting to bring his canine friend back from beyond the grave (IT'S ALIVEEEEE!). All in all, Frankenweenie is an enjoyable Halloween romp that's perfect for the whole family. Burton clearly loves his stop-motion animation, and the addition of a black and white aesthetic is perfect for recreating the feel of classic horror movies. Big kids and little kids alike are sure to share plenty of laughs and screams along the way. Child-friendly? It might seem like more of the same from Burton, but Frankenweenie is a frightfully fun tour through classic horror genres that children of all ages are sure to enjoy. And with Halloween only a few weeks away, this is the perfect film to get your family in the holiday spirit.